I really know that a lot of my friends would join, just for fun, a church that worships bacon – but I had no idea that one actually exists and already has over 4,000 members. 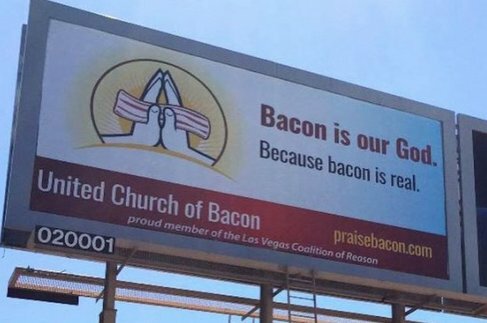 The United Church of Bacon was founded in 2012 in Las Vegas by ex-Marine John Whiteside under a healthy (or unhealthy – I am confused here!) premise that “bacon is our God, because bacon is real”. Well, at least you can’t argue with their logic! The church has been created to bring meat lovers (out of which most are obviously atheists) under the same roof and once you get there, you should be ready for some funky titles. Whiteside, for example, is the Bacon Prophet, while member Johnny Monsarrat calls himself ‘Funkmaster General’ and ‘Institutionalised Thought Leader’. Probably new members are crispy bacon and no beef jerky is allowed. The Church also has their own set of commandments (just nine), including ‘Be Skeptical’, ‘Have Fun’, and ‘Pay Taxes’. They offer their members free religious services such as weddings, funerals, and baptisms as well as, of course, praise for bacon. As silly as things are with the Church of Bacon, things got pretty heated up in Las Vegas because of some billboards placed around the city (you can check them out below): billboards that managed to upset religious leaders all ending up with Bacon Prophet Whiteside being refused notary services for an official document of the church last year. Well, at least they’re not banned from buying bacon, so they should be happy! What do you think about the United Church of Bacon? Do you, like me, have friends who would join this in a heartbeat just for fun? If so, make sure to let them know about it. All hail bacon!